I thought I’d make new free art for Halloween this year. I made THIS ONE a couple of years ago as a free download and it is still available too. If you like this, CLICK HERE or on the image, for the pdf. There are no watermarks and it is for personal use only. Don’t forget to leave a comment. I’d love to hear if you decide to print this. Gorgeous Regina. You are so talented! 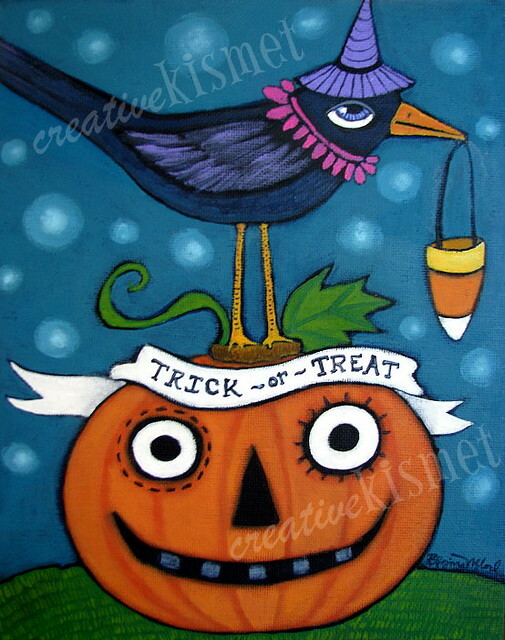 We dont celebrate halloween here in SA but I think this painting is great! Thank you! Can’t wait to get more ink for the printer, so I can get a good copy of this. I enjoy your blog, and have been impressed with both your art and your writing. Thanks so much for the print ~ I’ve been doing a lot of wool work lately and think it would be perfect piece for it! You’re very generous to share it! Love your work. Just printed out two of your halloween printables, and pinned them, not sure if you have more, but would probably love those too. Following you on Pinterest now. Thanks so much.